If your job is customer service, I know you will appreciate this post. Today I went to Albany City Hall to pick up a parking permit. Many of our downtown neighborhoods have limited parking and after many years, we now have parking permits. Of course I waited until the last minute but I thought this would be a good test of customer service. While waiting for some help, I noticed a diagram showing where the sticker is to be placed on your car window. Interesting, huh? 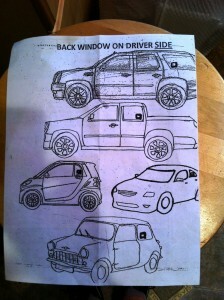 Notice the diagram on the side with the different types of cars and trucks. Does this mean the back side window means something different depending on your type of car? Are some back windows in different places? At first I laughed but still decided to ask the woman where I should put the sticker. “It goes on the back window on the driver’s side, she said, this diagram will help you.” She wasn’t condescending, she didn’t snicker, she was very nice. I figured I was on a roll so I should continue. “How many times have you been asked that question, I said. “Most everyone asks that question even if they look at the diagram. It’s something new and people just want to get it right.” Nice answer. I don’t know who does the customer service training for the City of Albany, but they did a good job. I thanked the woman, purchased my sticker and drove home. I decided to take Madison Avenue to look at the car stickers and see if everyone got the message. I could hardly believe what I saw, at least 7 parked cars had the stickers in the wrong window. One was actually in the front window, ouch. I actually spilled my coffee–I couldn’t stop laughing. As I parked my car, I noticed the car in front of me had the sticker in the wrong window. I can understand how difficult it is to be nice to some customers; particularly after you’ve answered the same question a million times. It takes a lot of patience, thoughtfulness and an understanding of human beings. People are often not focused on the task at hand, have other things on their minds, or just don’t care. It has nothing to do you. What can you do if you have a job where you have a repetitive task, and answer the same questions repeatedly? 1. Remember that people appreciate a smiling voice on the other end of the line or in person. It makes you seem friendly on the outside. No one will know what you’re thinking. My suggestion, think happy thoughts. 2. Most people don’t mean to be stupid; stupid just happens. 4. Treat every question as if it’s brand new. It may not be new to you, but it is to the customer. 5. Every day is a brand new day; start the day off with an appreciation that you are around to enjoy it. 6. Resist the temptation to tell the customer, “I told you so.” It never helps. 7. Be thoughtful, the next time it might be you. Lisbeth Calandrino helps businesses build loyal customer relationships with their customers. She does this through customer service/sales training and social media marketing. She can be reached at redhotcustomerservice @nycap.rr.com.